Because of the complexity and case-by-case variety of industry landscapes, business models and company structures, different companies have different needs about payment solution. In the past, when technology is not as flexible and open as it is now, customization of payment solution was almost impossible. All business adopted the same basic, generic payment technology, regardless the size, the industry and business model. It was like wearing a wrong size of shoe that didn’t fit your feet at all - and extra cost and extra manual effort might be needed to implement such generic payment method into existing business financial operation. 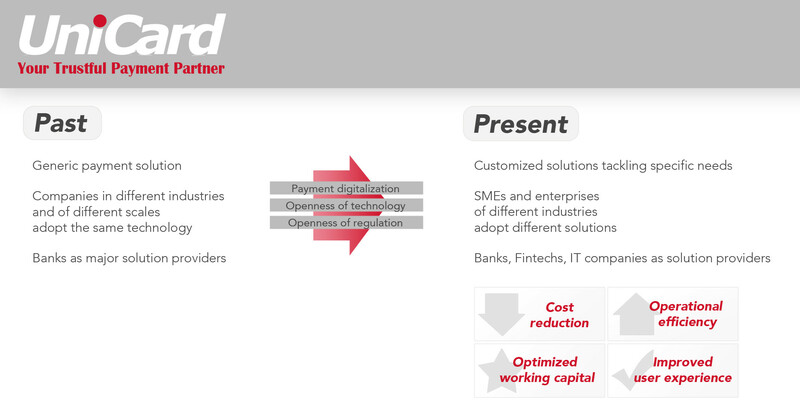 Recent 10 years, due to digitalization and openness of technology, supported by the opening of government regulations, solution providers are enabled to customize a range of B2B payment solutions that tackle specific pain-points of SMEs. The openness of technology and regulation encourages more small, niche fintechs to enter the payment market. They usually are price-competitive and focus on user experience. Instead of replacing existing payment infrastructure, they extract values from current payment systems to provide valuable service to SME. For example, some offer digital global payment solutions with simplified transaction reconciliation; some offer prepaid cards with enhanced customer analysis features; some offer mobile payment apps with easier access to reward programs. Nowadays, more innovative payment solutions are available in the market for reducing cost, raising operational efficiency, optimizing working capital, improving user experience and even expanding revenue. It may be the time for SME to explore which payment solution suits their specific business practices the best.